Introducing the new Sensaphone Wireless Sensor Gateway system. 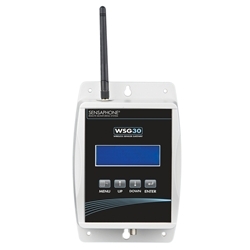 The WSG-30 is a unique wireless sensor monitoring system that can be used in more than one way. As a standalone system, it can monitor a variety of conditions from the wireless sensors and directly notify the appropriate personnel by sending e-mails and text messages. The convenience of having wireless sensors allows you to move your sensors around while tracking down heat problems within a data center. The WSG-30 is perfect for monitoring refrigerators and freezers for food and medical applications where running wires may be inconvenient or costly. The WSG30 can also be used within an existing industrial automation system and communicate directly with existing HMI software using the Modbus protocol. Sensor and transducer values can be sent wirelessly to the WSG30 main unit and then directly into your automation software. In addition to supplying live wireless sensor information to your existing automation software, the WSG30 can still independently send e-mail and text message alarm notifications at the same time. Up to 30 wireless sensors can be monitored by the WSG30 in addition to automatic power failure alarm detection and diagnostic alarms. All sensors are supervised with their battery level reported and monitored. If any sensor has a low battery or drops offline, a diagnostic alarm is generated and users are contacted. A rechargeable battery backup is also built in. • Up to 30 wireless sensors reporting back to the main unit. • Sensors can be up to 300 feet away. • Creates its own Mesh Network so that sensors can be used as repeaters and routers. • The Wireless sensors can operate on standard AA batteries for up to 3 years. • All sensors are supervised with their battery level reported and monitored. • If any sensor has a low battery or drops offline, a diagnostic alarm is generated and users are contacted. • Eight User Profiles can be programmed with 4 Contact Methods for each one, for a total of 32 alarm notifications. • Each Contact Method can be an e-mail or a text message. • Sensor Diagnostics for low sensor battery or sensor not responding. • Each sensor can be programmed with a schedule so that it is only monitored for alarms when you need it. • Even the alarm delivery to the users can be scheduled so that different people are notified for alarms depending on time of day and day of the week. • In addition to the flexible scheduling options, there is also the ability to have different people notified for different alarms. So, only the people responsible for a particular issue will be the ones who are notified. • Up to 64,000 time stamped records can be stored inside the WSG-30 to follow history and trends of the monitored conditions. • Data log history can be accessed directly through the built-in web page, exported in a standard format, or interfaced using XML. • The WSG-30 main unit includes an internal battery backup system that will power the device for up to two hours in case of a power failure.